Keeping track of your data source is important. That’s why Chart Studio automatically includes a link to the URL that hosts your data. You can also sync Chart Studio graphs with externally sourced data. These graphs can be shared by a URL or embedded in a webpage, and whenever a user views the graph, Chart Studio fetches the latest data from your web service. Use the external source plotter when you don’t want to send your user to Chart Studio. We have examples documented for SQLite, Flask, Quandl, Google Drive, GitHub Gists, and Dropbox. Data.gov is the home of the U.S. Government's open data and hosts over 124,651 data sets. They've recently built an "Open With" option that let's you send the data directly to Chart Studio to create interactive graphs for free. This feature is supported on smaller CSV and XLS files. Look for the "Open With" menu when searching through their data sets. When you go to Data.gov, you'll see a box to search the data sets and icons to browse by topic. We selected Consumer, which opens a description of the collection, highlights, and recent updates. Clicking on Data brings us to the data sets. The toolbar on the left lets us filter the data by type, tags, format, and more. If you want to quickly find data sets that you can export to Chart Studio, filtering the format to XLS or CSV is helpful. Once you select a data set, look for the "Open With" option (this will only appear on supported data sets). Click on plotly, and the data set will open inside Chart Studio. WebPlotDigitizer lets you automatically grab data from an image and export the data directly to Chart Studio. With Chart Studio you can recreate an interactive version of the graph, easily stylize your work, and even analyze the data. Let’s say, for example, you’re reading this Mother Jones article on the rising strength of hurricanes. The source of this data is an academic paper we don’t have access to, but WebPlotDigitizer can grab the data and send it Chart Studio. The first step is to save a copy of the image (or take a screen shot). Then open WebPlotDigitizer’s App. Click on File, and then Load Image. Upload your saved image. We select the plot type (in this case “2D (X-Y) Plot”) and click on Align Axes. WebPlotDigitizer gives simple instructions to select four points to align the axes. This particular graph has an $x$-axis with value labels but no tick marks. To be as precise as possible, we can mouse over a known value, such as the data peak at 1983. Any time you mouse over your WPD graph, the panel in the upper right corner zooms in and displays coordinates as $[x,y]$. Once we find the appropriate $x$-coordinate (in this case 73.78), we can move our mouse to the $x$-axis to select the first point. We use the same method for the other three points. Click Complete! once you’ve selected four points. We now enter the point values we selected for the points selected on the $x$ and $y$ axes. Because this graph has years on the $x$-axis, we use the format “yyyy/mm/dd”. Click Okay. We’ll use the default manual mode, and add a point by clicking on each peak and valley on the line that defines the graph. Once this is complete, we click on View Data to open the extracted data set. Click on the Graph in Chart Studio button to recreate the graph. Once the graph loads, you can click on VIEW DATA to see the underlying data. Check out our short video on Styling and Customizing Graphs to make the hurricane graph your own. Quandl is a search engine for numerical data. They host data sets from hundreds of publishers, all organized and easy to search. Quandl automatically sends data to a new Chart Studio spreadsheet, neatly formatted, organized and ready for graphing. From Quandl's homepage, select COLLECTIONS BROWSER from the "Platform" drop-down menu. You can navigate through Quandl's collections using the toolbar on the right. Here we selected MARKETS, COMMODITIES, Farms and Fishery. We chose the "Butter, AA Chicago" data set, supplied by the Wall Street Journal. 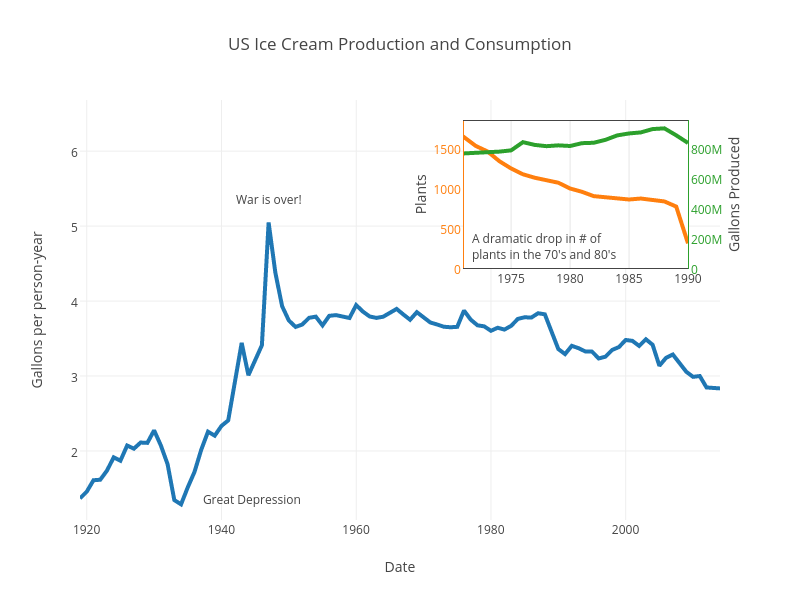 Click on the Plotly button, and the data set will open inside Chart Studio. Import.io is a great service to help you scrape data automatically from webpages. To utilize the Chart Studio export, you’ll need to head over to import.io and set up a free account. Ikea (in Canada) has 77 table lamps for sale on their webpage. Let’s say you are interested in the average price of their offerings, or perhaps would like to make a histogram of the prices. Instead of manually extracting the data, we can use import.io. Open import.io, and sign in. Enter the URL of the page with the data you want to extract. Click on Try it Out. You’ll see the data appear in spreadsheet form. Look for the pink Get API button in the lower right. Click it. Click on the Copy this to My Data button in the box that appears, and you’ll see the data in a form where we can select columns to extract. Click the Plot.ly button above the data. We can check the columns of data what we wish to extract to Chart Studio. Here we choose “producttitle_value” and “price_value_prices”. Finally, click on the blue Export to Plot.ly button. The data will open in a Chart Studio grid, where you can analyze and graph the data. You might like to check out our tutorials on basic statistics and histograms to get some ideas. Vernier develops and produces easy-to-use data-aquisition products (think sensors, data loggers, and experiments) for science classrooms and labs around the world. Vernier's Data Share Apps (built for iPad, Android, Chromebooks, and mixed-device classrooms), allow you to use their excellent hardware across platforms, from most devices. You can export data directly to Chart Studio, which gives you a seamless workflow on your Chromebook, iPad, or tablet. An export to Chart Studio with Logger Pro is coming soon. Click on the Download icon in the top-right corner of the Data Share web app. Select Export to Chart Studio to open the collected data in Chart Studio.